Enemy attacks once upon entry. After enemy attacks, enemy freeze a rune. If chilled rune is not dissolved immediately, it cannot be dissolved for the next 3 turns. Enemy only receives damage from enchanted rune. When enemy first attacks, enemy convert a random row to Water; When enemy second attacks, enemy convert a random column to Water; This effect runs as a cycle. Enemy removes all effects in play and reset CD of corresponding actives upon entry. Enemy weathers 2 runes per turn. When weathered rune is touched, rune spinning stops immediately and 3000 HP will be deducted. For 3 turns, rune spinning time is reduced by 2 seconds. Summoner need to make 7 or more combos to inflict damage to enemy. Enemy reflects 35% of damage received back to summoner. Non Water and Earth attack will be reduced by 75%. Enemy chills all runes upon entry. If chilled rune is not dissolved immediately, it cannot be dissolved for the next 3 turns. Summoner need to accumulate 50 Earth runes dissolved to inflict damage to enemy. When enemy's CD reaches 0, if counter has been reached, enemy will reset the counter and will not attack. When enemy attacks, enemy will deduct a fixed percentage of summoner's HP (ignore damage reduction and tumbler) and deduct 100% of self HP and chill 3 runes. When chilled rune is not dissolved immediately, it cannot be dissolved for the next 3 turns. For 5 turns, summoner's recovery is reduced by 50%. Enemy removes all effects in play and reset CD of corresponding actives upon entry. Every time after enemy attacks, enemy's ATK doubles, to the max of 32x. From 6th attack onward, enemy attacks twice in a row. Summoner need to dissolve 7 or more combos to inflict damage to enemy, else enemy will attacks for (7-N) times. Enemy places a permanent debuff upon entry: When Water is dissolved, summoner's ATK is reduced by 50%. Enemy only receives damage from enchanted rune. If enemy receives damage from non-enchanted rune. enemy attacks once with 100% of its ATK. Enemy marks all Earth runes every turn. If there are marked rune undissolved, enemy will fully recover its HP. Enemy will not receives damage from enchanted rune. Enemy only receives damage from effective attribute. On every alternating turn, enemy will not attack and change its attribute. 90% of summoner's HP will be deducted per turn until enemy is defeated. Enemy attacks once with 65% of its ATK upon entry. Every time after enemy attacks, enemy will burn 2 random position. Every time burning rune is touched, 10% of summoner's HP will be deducted. When enemy's CD is 2, enemy shoot a laser at vertical column; When enemy's CD is 1, enemy shoot a laser at random row; This effect runs as a cycle. Enemy masks 6 runes upon entry and greatly increase drop rate of masked rune. Enemy weathers 1 rune per turn. When weathered rune is touched, rune spinning stops immediately and 3000 HP will be deducted. Summoner need to dissolve 6 or more combos to inflict damage to enemy, else enemy will attacks for (6-N) times. When enemy attacks, 100% of summoner's HP will be deducted. Enemy attacks once upon entry. Summoner is unable to identify true nature of runes. Summoner need to dissolve Water, Fire and Earth runes to inflict damage to enemy. Enemy attacks once upon entry. After enemy attacks, enemy will electrify 2 runes. When electrify rune is touched, rune spinning stops immediately. If there is any electrified rune undissolved, summoner cannot attack. After enemy is defeated, enemy will revive once with double HP, ATK and DEF. Enemy removes all effects in play upon entry. First turn, enemy will convert a random rune type to Earth; Second turn, enemy will convert a random rune type to Heart; This effect runs as a cycle. For every Earth runes dissolved, 2% of summoner's HP will be deducted, accumulated until enemy is defeated. Enemy burns the leftmost column. Every time burning rune is touched, 10% of summoner's HP will be deducted. Heart runes cannot be dissolved. Enemy burns the rightmost column. Every time burning rune is touched, 10% of summoner's HP will be deducted. Enemy is invisible until it attacks for the first time. During invisibility, enemy is immune to all attacks (except active) and all control skills. If enemy attacks in invisibility, summoner's HP become 1 and for 98 turns, 40% of summoner's HP will be deducted per turn. Enemy locks all actives upon entry. Enemy burns the 6 most recent position during rune spinning. Every time burning rune is touched, 1000 HP will be deducted. Enemy burn a random column every turn. Every time burning rune is touched, 10% of summoner's HP will be deducted. Enemy removes all effects in play and reset CD of corresponding active upon entry. The lower the enemy's HP, the higher its ATK, to the max of 20x. When enemy's HP is below 30%, enemy attacks twice in a turn. 2 conditions need to be fulfilled to inflict damage to enemy. Water, Fire and Earth runes need to be dissolved. Light and Dark runes cannot be dissolved during initial dissolve. Summoner need to dissolve 8 or more combos to inflict damage to enemy, else enemy will attacks for (8-N) times. Enemy masks the whole board and only reveal during rune spinning. During rune spinning, enemy will weather a random rune. When weathered rune is touched, rune spinning will stops immediately and 3000 HP will be deducted. Enemy attacks once upon entry. Enemy electrify a rune per turn. When electrified rune is touched, rune spinning stops immediately. If there is any electrified rune undissolved, summoner cannot attack. Enemy burns a random position upon entry and spread to 2 adjacent position per turn. Every time burning rune is touched, 10% of summoner's HP will be deducted. First turn, enemy convert a random column to Earth; Second turn, enemy convert a random row to Water; This effect runs as a cycle. The lower the enemy's HP, the higher its ATK, to the max of 20x. When enemy's HP is below 30%, enemy attacks twice in a turn. Enemy converts a random rune type to Light upon entry. After enemy attacks, 2 runes will be chilled. When chilled rune is not dissolved immediately, it cannot be dissolved for the next 3 turns. Enemy electrify 3 runes per turn. When electrified rune is touched, rune spinning stops immediately. If there is any electrified rune undissolved, summoner cannot attack. Enemy ignore damage reduction and tumbler. Enemy marks the whole board upon entry and marks all Heart runes every subsequent turn. If there is any marked rune undissolved, damage received become recovery. Enemy converts a random rune type upon entry. When enemy first attacks, enemy convert a random row to Light; When enemy second attacks, enemy convert a random column to Light; This effect runs as a cycle. Enemy weather 1 rune per turn. The lower the enemy's HP, the more runes it weather, to the max of 4. When weathered rune is touched, rune spinning stops immediately. For 5 turns, enemy ignore damage reduction and tumbler. Attacks of enemy's attribute will be reduced by 90%. When enemy's CD reaches 0, enemy will change its attribute and convert runes to its own attribute. If runes of enemy's attribute is dissolved, 30% of summoner's HP will be deducted and enemy will heal HP accordingly. Enemy attacks once with 65% of its ATK upon entry. After enemy attacks, 1 random position will be burned. Every time burning rune is touched, 10% of summoner's HP will be deducted. Enemy attacks once upon entry. 2 random actives will be locked for 5 rounds. Rune spinning time is reduced to 2 seconds. When enemy's CD reaches 0, if there is no minions on the field, enemy will not attack and summon 2 minions. When there are minions on the field, enemy will not receive damage. Enemy removes all effects in play and reset CD of corresponding active upon entry. Enemy converts all runes to Heart upon entry and a random rune type to Heart every subsequent turn. Summoner's recovery become 0. When enemy is defeated, 20000 damage will be dealt to summoner (Except by active). Explosion damage can be reduced by leader skill and active. Enemy is immune to all attacks until it attacks for the first time. For 5 turns, rune spinning time is reduced by 2 seconds. Enemy converts a random rune type to Fire upon entry. After enemy first attacks, enemy convert a random row to Fire; After enemy second attacks, enemy convert a random column to Fire; This effect runs as a cycle. Enemy burns the 6 most recent position along spinning path. Every time burning rune is touched, 1000 HP is deducted. Every time after enemy attacks, enemy's ATK doubles, to the max of 32x. From 6th attack onward, enemy attacks twice in a row. Enemy fully recover HP every turn. Enemy locks all Human, God, Demon and Elf's actives and attacks upon entry. Enemy electrify 3 runes per turn. When electrified rune is touched, rune spinning stops immediately. If there is any electrified rune undissolved, summoner cannot attack. For every electrified rune undissolved, enemy attacks once additionally. Enemy only receives damage from enchanted rune. Enemy converts a random rune type to Light every turn. If Light runes are dissolved during initial dissolve, attacks of whole team will be nullified. The more Light combos dissolved (initial dissolve), the more times enemy attacks. Enemy electrify 2 runes per turn. When electrified rune is touched, rune spinning stops immediately. If there is any electrified rune undissolved, summoner cannot attack. Enemy ignore damage reduction and tumbler. Upon entry and after attack, enemy marks all Heart runes. If there is any marked rune undissolved, damage received become recovery. Summoner need to dissolve all Fire runes during initial dissolve to inflict damage to enemy. Summoner need to dissolve all Earth runes during initial dissolve to inflict damage to enemy. Enemy burns 10 positions along the two diagonals. Every time burning rune is touched, 10% of summoner's HP will be deducted. Enemy turns all runes along spinning path to monochrome. When enemy attacks, 70% of summoner's HP will be deducted. For every Heart runes dissolved, 5% of enemy's HP will be deducted. Enemy is immune to other attacks. When enemy's companion is defeated, enemy will absorb its dead companion's stats and fully recover HP. Enemy removes all effects in play and reset CD of corresponding actives upon entry. Enemy reduces rune spinning time to 2 seconds. When rune spinning starts, enemy will show 3 to 6 orbs. Summoner need to dissolve exact no. of combo during initial dissolve to inflict damage to enemy. Enemy's no. of attack is equal to difference in combo. Summoner need to dissolve 9 or more combos to inflict damage to enemy, else enemy will attack for (9-N) times. Enemy weather 1 rune per turn. When weathered rune is touched, rune spinning stops immediately. Enemy weathers 1 rune during rune spinning. When weathered rune is touched, rune spinning stops immediately and 3000 HP will be deducted. Enemy marks all Water runes every turn. For every marked rune dissolved, summoner's ATK is reduced by 20%. Enemy attacks once upon entry. Enemy converts Heart rune to Dark every turn. If Dark runes are dissolved during initial dissolve, attacks of whole team will be nullified. The more Dark combos dissolved (initial dissolve), the more times enemy attacks. For 98 turns, rune spinning time is reduced by 3 seconds. Enemy electrify 2 runes per turn. When electrified rune is touched, rune spinning stops immediately. If there is any electrified rune undissolved, summoner cannot attack. Based on the info, Fire and Dark are the most difficult one. Which one is more difficult depends on what kind of team you have. This is then followed by Water and Light. Earth is the easiest one. That's a lot of work but as always much appreciated Arigato! I've only tried water and fire but they're quite tough, looking forward seeing creative teams clearing these stages. The enemy will lock the Active Skills of all Gods, Demons, Humans and Elves from the first Round onwards. Each Round before Summoner starts moving Runestones, 3 random Runestones will be electrified. If any Electrified Runestone is touched, Runestone movement will be stopped immediately; if the Electrified Runestone is not dissolved, no Damage could be dealt to the enemy that Round. The no. of attacks of the enemy increases with the no. of Electrified Runestones. which basically says the skill should lock God, Demon, Human and Elf's active and attack instead. I have update the DSI accordingly. Using non-dragon/beast team will most likely need you to have something to counter this insane lockdown. Clear Earth extra yesterday, use yog-3 enchantress team. After R8, just on enchantress and YOLO all the way. Just clear Light extra today. Copper bullet dragon team is kinda the perfect counter for this stage. R1 - R9a, normal spin all the way. 25% tumbler shield should be tankable with the HP pool. R9b, on Novalis, 1 combo to remove heart runes, then burst with ursula. R11, perfect for copper bullet active. Use it to avoid all explosion and the initial shield damage, then normal spin to kill. R13, try to stall through the debuff, then burst with Ursula for both HP bar. Use copper bullet on first HP bar for extra damage in R13b. R14, Kill 1 ASAP, then can slowly kill. R15a, the row explosion is perfect for electrified runes, can stall through. When Ursula is back, use Ursula and copper bullet. R15b, Copper bullet will enchant all runes so no worry for enchanted shield, use Dark golem to remove Light runes and generate Dark runes, then use whatever remaining active, lol and of course craft just for the sake of using it. 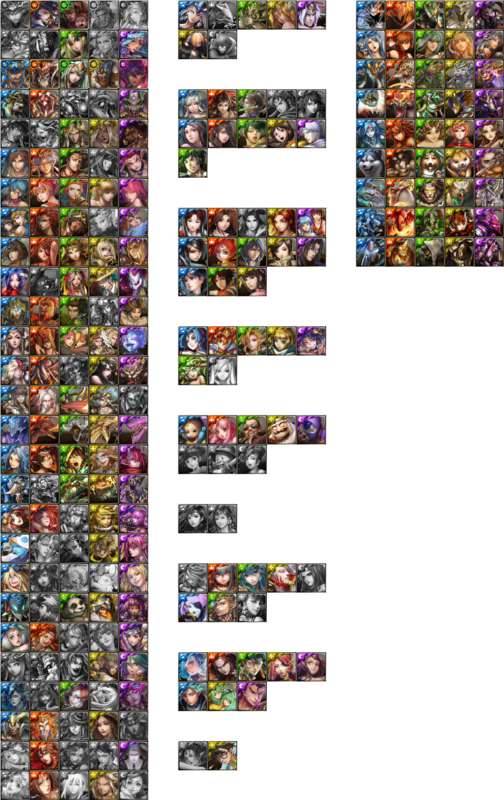 Earth: Dual Beelz + Dual PR ML, PR Luna, Minamoto. Turn on ML when you can and kill everything quickly. Mina ML team skill for the boss. Dark: Dual Yog + Dual PR ML, PR Luna, Minamoto. Strategy in spoilers. Hep teams should be able to clear without much difficulty either. Rd 9b-11: Spin normally. Use ML convert if needed, particularly since one of them will be reset in a few rounds. Rd 12: Hit the left one a bit then full attack to kill them together. Water: Dual PR Dumuzi, VR Freyja, PR Medusa, PR Nidhogg, PR Sagittarius. Strategy in spoilers. Non-PR Dumuzi and Athena teams can also clear but it requires the Medusa/Sagittarius Amel IV combo for the boss. Since enchanted rune damage is reduced to zero and you need to use superior attribute to kill, the idea is to use Medusa to turn the boss to earth, and then use Sagittarius' fire attack to kill it. Sagittarius needs to be Amel IV because at Amel III or lower the fire attack only triggers if a single attack is done; Amel IV allows a full attack. Rd 8 Try to kill the wolf on turn 3 of the debuff if possible, just makes things a little less stressful on the reflect stage next. Fire: Dual Yog + Dual PR ML, PR Luna, Pugnacious Puppet Pinocchio. Rd 1-9a: Normal spin. Turn on ML when ready. Rd 10-12a: Normal spin, grind back Yog. Rd 14: Target middle first so you can get rid of heart runes. Use DC if needed. Rd 15: Pinocchio snipe and kill within 3 turns. Rd 20b: If you're impatient use Yog #2 and DC. I whittled down his health a little bit before bursting. 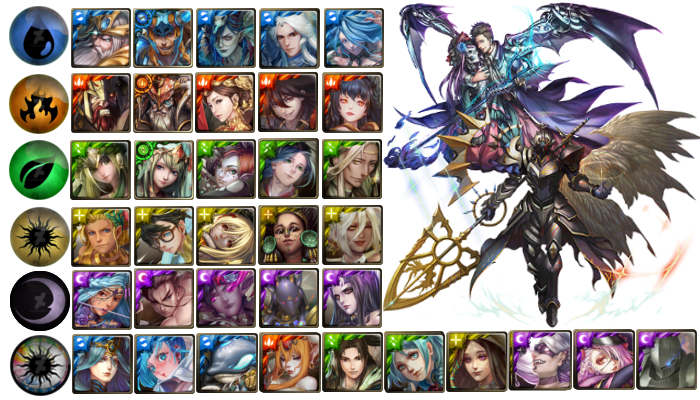 Light: PR Barbara + PR Byakhee, PR Shu, PR Medusa, Haza + PR Nidhogg. It's a bit tight but doable as you can see from the video Brought the slashing DC to remove attribute weakness on Diablo. Having said that, I can see there are plenty of Babylon/Greek teams that can also clear very comfortably within the round limit. Rd 1-9a: Kill ASAP. Use Barbara/Byakhee team skill and Haza skill 1 as often as possible to speed things up. e.g. round 7 since he has a lot of hp relative to everything else. Rd 9b: I used Shu, Nidhogg, Haza skill 1 and Barbara convert although it was a bit of overkill. Don't need to use Haza here. Rd 12: Haza + Barbara convert and kill quickly. Ideally want your actives back up before Diablo. Rd 13a: Shu + Medusa and spin a bit. Can also use Barbara convert if needed. Rd 15a: A bit grindy. Try to burst it down with Shu, Nidhogg, Haza active 1.